Many people assume that in the US, only people in the deep south are growing okra. However, in recent years, it is being grown farther and farther north. This can be attributed to a variety of factors, including the popularity of southern cuisine. Okra is easy to plant by direct sowing the seeds in your garden about 2 weeks after the last expected frost in your area. When soil temps are around 65 degrees F, okra seeds can take a month to germinate. If the soil temps is around 75 degrees F or higher, germination takes place in about 2 weeks. Seedlings are difficult to transplant because the plants don't do well when their root system is disturbed. 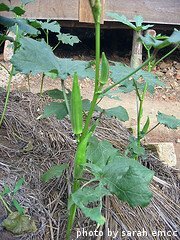 Okra grows very fast and is usually ready for harvest in about 60 days. Okra plants will keep producing pods as long as you keep picking them and the growing conditions are good. Generally the shorter, younger pods are the most tender. Okra plants love hot weather and thrive when air temperatures are at least 85 degrees F during the day. They require loose, well drained soil and can be grown in both containers and traditional gardens. They need to be planted in the sunniest spot you can find and need a minimum of 6-8 hours of direct sunlight daily. When growing okra, keep in mind that the plants have good drought resistance, but do best when they receive about an inch of water per week. This is especially important when they are setting pods. It's also important to note that the plants get very large as the growing season progresses, so it's important to give them enough room to grow. They also use up plenty of nutrients from the soil, so fertilizer and crop rotation is key. There are a couple of dozen okra varieties available to the backyard vegetable gardener. They vary in size and color and shape of the pods. 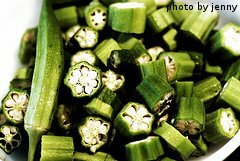 Okra is packed with nutrients. It can be stewed, fried, boiled, sauteed, pickled or roasted. It can also be used as a thickening agent in gumbo and soups and stews. In addition, okra tastes great when eaten raw - it has a nutty flavor. Okra stores well for several months in the freezer.